There's a long line of British Heart Foundation, sponsored cyclists, heading west along the sea wall towards Reculver Towers. Now the rain's stopped, I think I will jump on my racing bike and join them; hopefully without any incidents, such as sudden wildfires, along the way. I've been busily adding more of my favourite photos to my new Tumblr account and readers may find some of them familiar but with a different perspective. The Lancaster in the photo, I was also lucky enough to catch one afternoon doing a remembrance run for the 'Dambusters' around Reculver towers. I appear to have run through 20,000 discrete page views here in the last month. What prompted the sudden increase in readership is hard to say and I'm sure equally undeserving, although the David Tennant news drove an extra 1,750 in my direction. I do notice though that the 'troll' now appears to have given-up, for now at least. Either that or his medication is taking effect. I don't doubt he will be back in the future. Time to change into cycling lycra then! Footnote: I see that some of the beach huts in Minnis Bay have been vandalised again. Will it never stop! I wish I'd known about the sponsored bike ride earlier. I ran along the seafront to Birchington this morning but would've preferred a nice cycle ride! Simon while my blogger statistics continue to rise, I believe mine even exceed yours at the moment at 20,930, the statistics I collect independently of blogger by embedding a code in the site show a 20% fall during the last month, and the more modest figure of 11,600 page views for last month. This recent disparity between the two statistics seems coincide with some bizarre traffic sources on the blogger statistics. The independent statistics are showing Thanet Life and Bignews as my main traffic sources, other than direct and search engines, the blogger statistic show t.co j.mp goo.gl as my main traffic sources during the last week. Are you also getting these bizarre urls as your main traffic sources? Don’t know Simon, I would guess from a combination of the number of comments and that I have posted much less than usual in the last month - due to spending my spare time painting and drawing - that my traffic is down. and so on take one to some strange places, I don’t recommend visiting these sites unless you are very sure of computers protection. It is a case of being fairly certain that these rising statistics don’t represent reality and having a fair idea of the benefits in telling bloggers that their readership is rising when with thanetonline blog I am fairly certain it is declining. I suppose with Thanet life you would be the on one with the gut feeling, do the statistics coincide with what you think is going on? Some are comment spam which suddenly appears and peaks and others are those abbreviated Twitter links, which you are quite correct in assuming are potentially dangerous and are a growing attack vector for malware. Best avoided! This is all getting a bit like a willy waving contest ... mine is bigger etc. Grow up, lighten up and leave nerdsville behind. Or you may even find diminishment that has nothing to do with cold weather. 5.37 I suspect the conversation has passed right over your head! This isn't about 'Willy waving' but origin. What's prompted the extra jump in traffic and Michael is asking whether I am seeing the same referring URLs as he is. Circulation is always going to be a matter of interest as it is to newspapers in the real world! Very sad to hear of the cyclist dying from a probably heart attack during this event. Does anyone have more details? Did he have a history of heart problems? Is that picture genuine. Looks like a more period shot to me, i.e. one from the past. Ah right. I am dubious about adapting pictures, which is why I preferred the pre-digital era. I always think it's a bit like toying with the truth. Was the Lancaster approaching from the North East or the North West? I am no good at geography! The sea is so blue, it could almost be the Pacific, if you extend poetic licence a bit more. Looking at the brickwork, I would guess the Royal Marines, nor maybe the Reserves, have been doing some re-pointing. What you are trying to prove, I'm unsure of, beyond your usual snide and deeply pathetic disrespect to our armed forces, which I now take for granted. 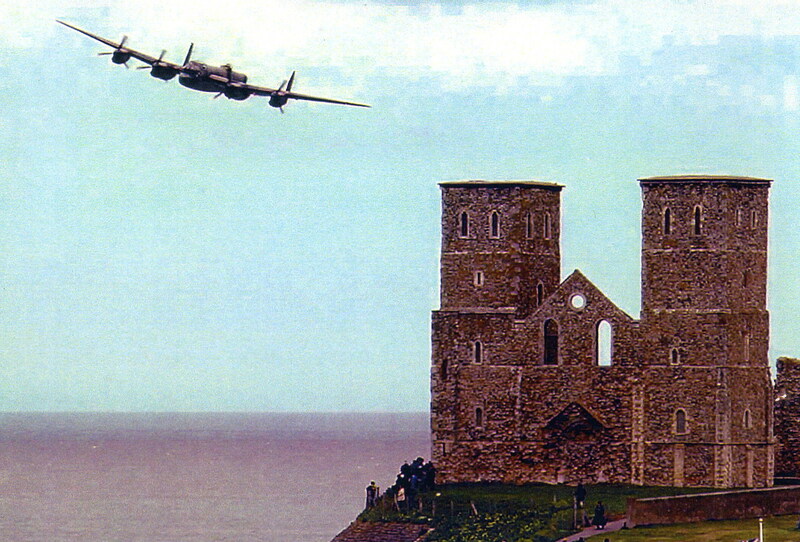 It's not unusual for the BBMF Memorial Flight Lancaster to be seen at Reculver, because after all, that's where the Dambuster practised with the early bouncing bombs. I've see it there myself several times now. As for Pacific Blue, I can give you any colour or hue you like. I can make the photo look old or new or even re-pointed or re-painted. I read this with a sense of deja vu then I realised that this wasn't illusory. Did you not publish this last weekend? I'm a bit puzzled over your last exchange with Anon. To be honest I didn't see anything particularly snide or offensive - I'm sure our armed forces can withstand the odd unfavourable remark. You've obviously identified this Anon as one with whom you have crossed swords before. So, how can you tell one Anon from another? Or is it just an educated guess? All to familiar I'm afraid. It's our 'Troll' who is passing his message in the subtext. Sorry, still puzzled. Apart from the snidey remark about the brickwork that seemed a pretty innocuous conversation about the pros and cons of manipulating digital photographs. To be honest even the brickwork comments were relatively tame - Marines don't usually double up as brickies - so your belief can't be based on content. How can you be certain that all these Anons are the same person? Oh, and put me out of my misery please - this is a repost isn't it?